This is an awesome 100+ yr old home with an adorable guest cottage. The owners are Interior Designers and underwent a 2 year renovation after purchasing the home. The house is decorated in a very casual cottage style using the soft colors of sea glass. As you enter the bright colorful kitchen you are immediately relaxed by the warmth and comfort of the home. The kitchen is open to the dining room which seats 6. There is a den with flat screen TV and reading area with a complete wall of windows to enjoy the beautiful Maine sunshine. In this area, there is also a small game table to enjoy various board games or a checkers challenge. Sometimes we use this for an extra dining area if needed. The master bedroom (king with TV)is downstairs and has a full bath with Jacuzzi tub. There is an additional 1/2 bath downstairs in the laundry room. Upstairs are 3 bedrooms (2 full with TV and 1 twin bunks)with a full bath. There is also a den with a full sleeper sofa. The den has a TV and high speed internet access with wifi. An outside large deck is accessible from the upstairs den as well as the side lawn. Enjoy the harbor views, a great book or evening drinks with your family and friends. Its also a great place to have an outdoor lobster picnic!! The garden cottage has a small covered porch with a swing. Inside is a full bedroom (queen with TV), full bath(shower) and a small kitchenette. The cottage is ideal for a couple who wants some quiet time away from the house. The house has a beautifully landscaped yard. Enjoy the numerous flowers and shrubs with something in bloom at all times. Neighbors constantly stop to comment and admire the garden. There are even blueberry bushes on the side for you to pick from and eat!! There are sidewalks all the way to town, so you can enjoy a nice walk around the harbor to shops, restaurants, churches or the footbridge which takes you across the harbor. Or if you prefer to ride, the free trolley stops just across the street in Brown's parking lot. We own The Southern Charmer Interiors and love to travel and to renovate old homes. Sea Glass is one of our favorites!! We fell in love with Boothbay Harbor after a visit in the 1990's. We returned in 2003 to look for a vacation home and found this gem which was to be demolished. We couldn't let that happen. It was just perfect!! Beautiful views, wonderful gardens, great location...it had everything we wanted. And we loved the challenge of the renovation. Also, we could walk to the lobster dock, buy dinner off the boat and bring it home to cook! Our home is very family friendly.It is ideal for small family reunions and groups. It has several quiet spaces where you can get away if you prefer. The separate cottage is perfect for in-laws or a bridal suite. Everyone seems to enjoy the lawn as something is always blooming. It is just perfect to admire or cut flowers to bring inside. We have movies and games as well for the kids. We love to walk just down the street to the Lobster dock...purchase fresh from the boats..and return home to enjoy a Lobster feast on the outdoor deck. YUM YUM!! Its also close enough for walks into town for shopping or dining. For the second year we have enjoyed our stay at Christmas-time. This home is large enough to accomodate our family and cozy enough for everyone to feel comfortable. The location is convenient to all that BBH has to offer. The kitchen is fully equipped. As it was last year, the home was spotless when we arrived. We look forward to spending next Christmas at Sea Glass Cottage. We are so happy that you had a great Christmas stay. We are happy to have you anytime!! Thank you. This was the perfect place to stay. Located within an easy walk to Boothbay Harbor shops and excellent restaurants. The cottage was clean, well taken care of, comfortable beds, and cozy seating areas. Staying with dear girlfriends in this lovely home made our week even more memorable. Would definitely come back here to stay. The Seaglass cottage is a beautiful house perfect for our week in Boothbay Harbor with family and friends. There were seven adults and a 5 month old baby in this house (and cottage) and it was perfectly sized. 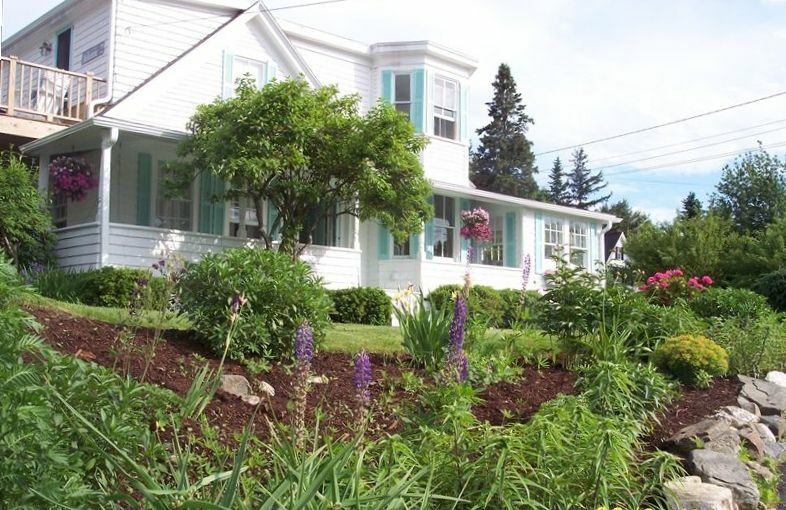 It is within easy walking distance to the central area of Boothbay where shopping, eating, and sightseeing abound. The house is well stocked with everything you need to settle in and relax, and have lobster feasts. There is even a great place to buy fresh lobster that is a 5 minute walk from the house! Boothbay Harbor couldn't be more picturesque and this house fits the bill, it is just as beautiful inside as it is on the outside. The owners of this property are very kind and the home is tastefully decorated. The kitchen is well stocked for cooking and baking or steaming your own lobsters. Because the home is within walking distance from downtown Boothbay it is really in the best location. It is away from the busiest parts of BBH but close enough to take a stroll into town or a quick drive to Hannafords for groceries. The beds are very comfortable and the cottage that is available on the property is always fantastic for guests and family members. Beautiful house and gardens with lots of places to sit both inside and out. Especially loved the upper deck. Cottage was as cute as can be and perfect for my son and his mate who liked to sleep in. Beds were comfortable, water pressure was a treat. Games and puzzles were a bonus. Perfect location! Quiet. Easy walk into town, but lots of eating places across the road, too. We had a wonderful week with our children and their significant others. Would definitely return someday (but would bring some brighter lamp bulbs for reading). Thank you for the kind words. We are so glad you had a nice time and enjoyed your stay. We will make sure to get some stronger bulbs in the lamps. Hope to see you again soon. This stunning house provided my family with such a memorable vacation. It was spacious and had such a relaxing feel for my husband and 2 young kids. A perfect house for a large family or multiple families. The location was prime and allowed us to take several mini-trips around the area. It's walkable to the main center for shopping and eating as well as a quick drive to the grocery store. Yard was nice and big for playing games with the kids. Overall, we were beyond pleased with this house and would definitely stay again! Thank you for your kind words and we are so happy to hear you had a great stay. We look forward to having you again! Payments are to be made directly to the owner upon receipt of a reservation contract received directly from the owner. The reservation is not confirmed until a signed contract and 50% deposit are both received by the owner. Upon final payment, all house rules including check in/out will be supplied to our guests.